The fort of Roopangarh was built by Maharaja Roop Singh of Kishangarh, 350 years ago in 1648 AD. The fort was built to protect the city Roopangarh (which means ‘city of beauty’). The city remained their capital for over 100 years. This ancient architecture is now the heritage hotel for the modern guests. 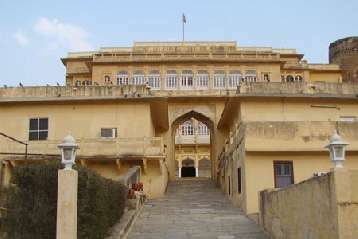 The fort can be reached from Kishangarh railway station which is 25 km away. By road it is 30 kms from Ajmer and 110 kms from Jaipur. The nearest airport is Sawai Mansingh International Airport Jaipur about 120 m away. The famous heritage sites to visit nearby are – Phool Mahal Palace and Kishan Garh Fort. The famous Gondalo Lake is breeding hub for many birds which flock here every year. And Sambhar Salt Lake hosts maximum flock of Flamingos and other wild birds. The fort allows the history lovers to explore its premises for step-wells, secret passages, jails, granaries, armories and foundries are still preserved. For recreational activities, the fort organizes – Heritage walk in the Roopangarh Village, Camel Safari, traditional folk dance and music performances, puppet show and cultural shows. The 22 Deluxe rooms of the fort are for business travelers, leisure travelers, families and small groups to visit this beautiful city. The rooms are fully air conditioned with a spacious master bedroom accompanied with sitting and dining area furniture and a dedicated space for executive work desk. The room also has a beautifully carved wood swing. 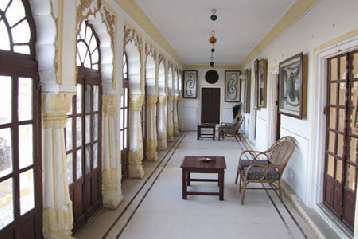 The bay windows open to the view of Roopangarh. You have the option to choose Double bed or Single bed rooms. All the Deluxe rooms are uniquely themed from others in terms of wall colors, flooring, furnishings, patterned bedding, antique furniture put, hanging lamps and wall paintings; every item is hand-picked for each room. The attached modern furnished bathroom has bathtub, shower, slippers, bathrobes, hair dryer and well equipped with essential luxury toiletries; with round the clock hot and cold running water facility. There is cable television, laundry service & direct dial telephone facility. 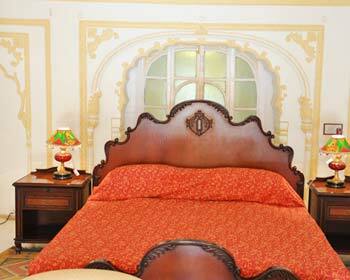 The sole Queen’s Suite at the fort is a place for luxury lifestyle stay in Ajmer. Families and groups should prefer to book the suite. 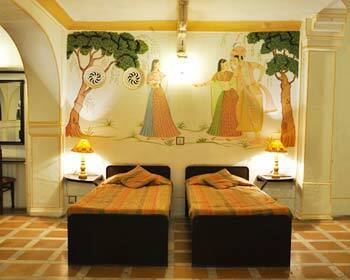 The suite showcases traditional Roopangarh culture and colors with the use of wall art depicting life of Maharajas with their Queen, hanging lampshades, artistically carved archways, colorfully carved out high roofs, hand-worked curtains, furniture style, antique artifacts and portraits. The suite is fully air conditioned with a spacious bedroom having twin beds; the room is accompanied with sitting furniture. The archway leads to separate living room which is equipped with soft big sofas, sitting chairs and dining furniture. A work desk is also provided. The bay windows open to the resort landscape view. The in-room facilities are – cable television, direct dial telephone facility & laundry service. The luxuriously furnished attached bathroom has bathtub and shower combination, essential luxury toiletries, hair dryer, slippers and bathrobes; with 24 hrs hot and cold running water facility. 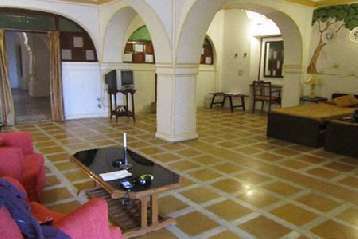 The in-house restaurant at the fort is a place for luxury dining. The marble floored place is adorned with wall paintings of Maharaja Times, well preserved armory on artistically crafted colorful walls. In contrast with the bright ambiance, the furniture is given a bold theme. Your entry is highlighted with Blue Carpet walk. The master chefs try their hands on Indian, Chinese, Thai & Continental delicacies. But restaurant is known for its authentic Rajasthani cuisines, the recipes of which were tried by the earlier generations. You can ask for a la carte meals or try their special buffet offerings.